This file image shows U.S. tax forms. Waiting until the last minute to pay your taxes can cost you if you are expecting a refund, since the government hangs on to your money and receives more interest on it. However, if you owe money to the government, that same principle applies to you. Extending your deadline to file does not extend your payment time. You are expected to pay the amount you owe, or your best estimate, by the April 18th deadline. If you do have to make an estimate, it is usually best to err toward overpaying. 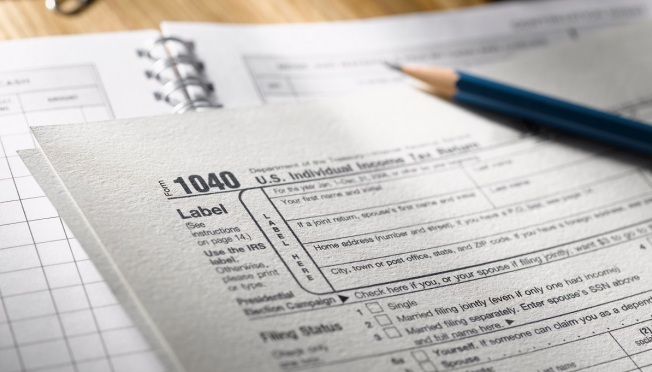 Paying too much can always be applied to next year’s taxes, but paying too little requires that you pay interest on the difference – and could expose you to an audit if you greatly underestimate the amount. Check/Money Order – The classics never go out of style. The IRS accepts checks or money orders payable to the United States Treasury. Include your phone number, Social Security number, and the 1040-V payment voucher (or other voucher as appropriate for the tax form you are submitting). Credit/Debit Cards – There are six IRS-approved payment processors for credit or debit cards. Links to these vendors may be found on the IRS website. Debit card charges are usually flat fees ($2.50-$3.95) and credit cards are charged as a percentage fee (1.87 percent -2.25 percent). Electronic Funds Withdrawal (EFW) – Essentially, this is the reverse of direct deposit. Most e-filing methods require EFW. This has to take place as part of the electronic filing process – you cannot initiate EFW after your taxes have been submitted. Check with your financial institution and verify that they allow EFW transactions. If so, they will supply you with the routing number and account number for the account from which you wish to have the funds withdrawn. Do not assume that the routing number on your checks is the correct one – sometimes extra internal routing digits are included, and the numbers need to conform to the IRS standards. You will need to supply a contact phone number, Social Security numbers for every filer, and a payment date. You can still choose to have your payment made on April 18th, even if your form is filed earlier. Electronic Federal Tax Payment System (EFTPS) – This is the IRS-run equivalent of EFW. It has the advantage of allowing same-day wiring of funds from your account, and is useful for scheduling regular estimated tax payments for the self-employed. EFTPS requires registration with the IRS. It can take five to seven business days to register, so make sure you leave enough time for your registration process to be completed before your payment deadline expires. Electronic methods can be used on all 1040 Series forms, but not all tax forms or taxes can be handled through electronic payments. For details, check the links available on the IRS website. This page also contains links for businesses to use in electronic payments. Should the computer gremlins attack or you spill coffee on your keyboard, you can still pay by phone using one of the IRS-approved credit/debit card processors, or by calling the IRS directly and using EFTPS. Choose whichever payment method works best for you, and pay at the last minute with confidence. Just do not forget to make that payment before the deadline, or you’ll have to make a much bigger payment later. How Will the New Mortgage Rules Affect You?